Los Angeles, CA – One of the most loved and best selling groups in all of country music is set to release their first ever live hits album Boys Night Out on April 15, and to celebrate this momentous occasion, the band has partnered with its label Cleopatra Records and digital distributor The Orchard to offer fans the opportunity to win a special VIP concert package. 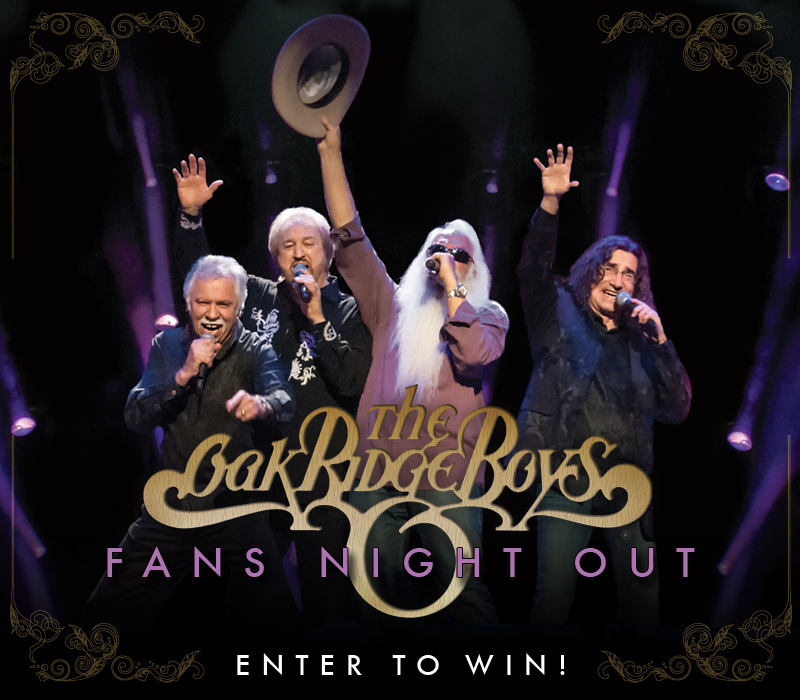 The contest, dubbed “Fans Night Out,” will run for the entire month of April after which one lucky participant will be randomly selected to win 4 tickets to an Oak Ridge Boys show of his/her choice along with a $50 debit card, and, most exciting of all, an exclusive meet-and-greet with the Oaks themselves! It’s a dream come true for any ORB super fan, as well as an expression of deep gratitude from a band so well known for their generous and humble spirit! The release of Boys Night Out, which features such iconic hit singles as “Elvira,” “American Made,” “Bobbie Sue,” “Y’all Come Back Saloon,” and others, has sparked new interest and appreciation for this long-standing quartet. The band was recently featured on both Bloomberg TV as well as Fox’s Wendy Williams Show, where they were presented with a plaque from the RIAA certifying the sales of 41 million albums! The Oak Ridge Boys also recently held another exclusive meet-and-greet for an extra special longtime fan of the band, Former President George H.W. Bush, who spent time with the group backstage after their show in Galveston, TX. And the Boys will continue their intensive touring schedule, crisscrossing the continental US through the end of 2014, and providing fans plenty of opportunities to catch one of the hottest country tickets around! 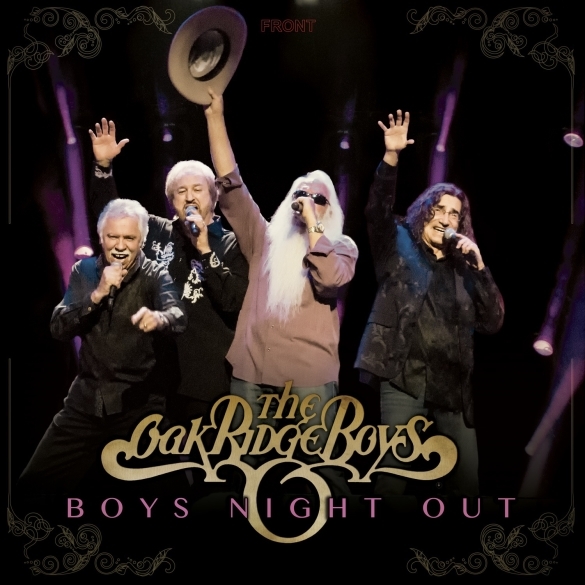 Oak Ridge Boys Ink Deal With Cleopatra Records To Release Their First Ever Live Country Album! Los Angeles, CA – With a legacy that stretches across 6 decades, encompasses more than 41 million albums sold, and includes numerous iconic hit singles such as “Elvira,” “American Made,” and “Y’all Come Back Saloon,” it’s no wonder that The Oak Ridge Boys are one of the most popular live acts on the circuit today, packing fans in by the thousands and tens of thousands wherever they perform. What is surprising is that the Boys, renowned for their great live shows, have never released a full length, official hits concert album – that is, until now! Cleopatra Records will release Boys Night Out on April 15th, in three formats – CD, vinyl, and digital download – finally giving ORB fans the experience of the group’s well-polished live performance for them to enjoy anytime, anywhere. To be sure, Oak Ridge Boys fans have been clamoring for a live album of hits for several years now, but as the band explained, “For some reason or another, the time never seemed right.” Then, in early 2013, lead vocalist and producer Duane Allen saw the stars align as the band was able to get its hands on some top quality remote recording equipment, and promptly began capturing performances of their current show dubbed “Boys Night Out.” Night after night, The Oak Ridge Boys wowed audiences across the nation with a set list that packed all of the group’s hit singles and fan favorites into one magnificent celebration. Years of preparation have made such well-loved songs as “You’re The One,” “Thank God For Kids,” and the brilliant “Bobbie Sue” sound even more exhilarating than when they were originally recorded! It might not be quite the same as being there, but it’s thrillingly close!